What can you eat? Let’s talk about what you shouldn’t eat! For the first day or so, stick to soft foods. Avoid tough meats, hard breads, and raw vegetables. 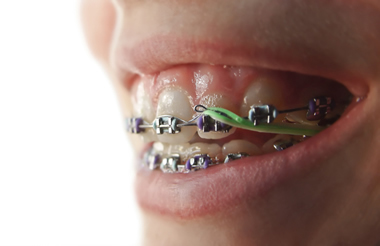 You’ll need to protect your orthodontic appliances when you eat for as long as you’re wearing braces. Use common sense when choosing food to put in your mouth and avoid chewing on hard objects such as pens and pencils. The higher the sugar, the higher the chance of tooth decay! Acid in candies can also be very harmful for your teeth! The lower the pH, the higher the risks for tooth decay. The longer the substance is in the mouth (slowly dissolving) the higher the risk! Be sure to brush TWICE a day and floss regularly! Drink lots of water! Avoid candies and sugar that are harmful to your teeth. If you play sports, it’s important that you consult us for special precautions. A protective mouthguard is advised for playing contact sports. If you would like a mouthguard, please talk to any member of our team. We provide mouthguards to our patients for $10. In case of any accident involving the face, check your mouth and the appliances immediately. If teeth are loosened or the appliances damaged, phone at once for an appointment. In the meantime, treat your discomfort as you would treat any general soreness. Dr. Perih is now a provider for Under Armour Performance Mouthgear. These are custom made for contact or non-contact sports. Don’t be alarmed if a wire or band comes loose. This happens occasionally. If the wire protrudes and is irritating, use a blunt instrument (the back of a spoon or the eraser end of a pencil) and carefully, gently push the irritating wire under the archwire. Simply get it out of the way. If irritation to the lips or mouth continues, place wax or wet cotton on the wire to reduce the annoyance. Call our office as soon as possible for an appointment to check and repair the appliances. If any piece comes off, save it and bring it with you to the office. As a general rule, an emergency appointment may be made when there is severe pain, a loose band, a broken wire or something sticking out that you can’t take care of. It’s important to know the names of the parts of your appliances. It will help when you phone the office to be able to identify what part is broken or out of place. For additional information please visit our emergency care page.